Are You in the Right City to Be a Female Entrepreneur? A few weeks ago, we wrote about the best cities for freelancers. Now we are looking at the best cities for entrepreneurial women. Though it really comes down to the person, the city you decide to start your business in can make a major impact on whether your business sinks or swims. Women-owned businesses have grown by over 54% since 1997 at a rate 1.5 times that of the national average, according to the American Express OPEN study. Pretty impressive considering the U.S. Global Entrepreneurship Monitor says that women start ventures with eight times less funding than their male counterparts. 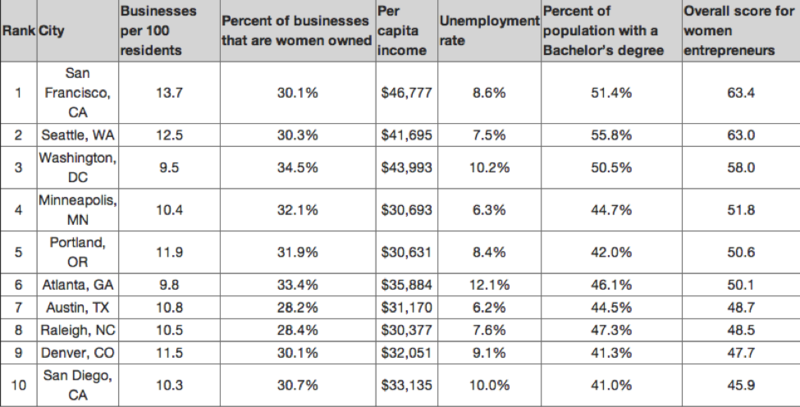 NerdWallet compiled a list of the best cities for female entrepreneurs. They looked at the entrepreneurial climates by the number of businesses per 100,000 residents within city limits. Then they looked at the percentage of those businesses that are currently women-owned, which the firm considers a good measure of opportunities for networking or mentorship within the community. Finally, they looked at the financial health of the city as measured by median income and unemployment rate. Texas doesn’t seem to be messing around either when it comes to women-run businesses. According to the State of Women-Owned Businesses Report, the Lone Star State has an estimated 666,600 women-owned firms that employ 603,100 workers and have roughly $105 million in revenue. Texas’ growth in women-owned firms from 1997 and 2012 was the fifth-best in the nation at 75%. The lower cost of living and lower cost associated with starting a business in comparison with more expensive cities like New York, Boston or San Francisco is a definite plus for Southern ladies. Georgia currently has an estimated 317,200 women-owned companies, up 118 percent since 1997, according to the 2014 State of Women-Owned Businesses Report. The companies employ 240,200 workers, up 26 percent, and have combined sales of about $45.6 billion, up 80 percent. Two-thirds of the state’s women-owned companies (202,400) are in metro-Atlanta, which has seen a 63 percent increase since 1997. So what does this mean? This means that if you are planning on starting your own company or taking your side hustle to the next level, you may want to consider being based in or near one of these cities. You will be around more investors and more like-minded people, which will help build out your network. It’s tough out there for female entrepreneurs so try to give yourself every advantage possible. This piece was written by Meredith Lepore and is reprinted by permission.